BAI calculator is an excellent tool for all people who want to keep their bodies healthy and fit. With its help, you will check your body adiposity index and, thanks to the guideline table below, you will find if your BAI is within a healthy body fat level. Read the supporting article to study what is BAI, how to calculate body fat percentage and see the ranges for underweight, healthy, overweight, and obese. BAI is an abbreviation of body adiposity index. This parameter defines your total body mass that is made only of fat tissues. The calculations are based on a comparison of the person's height to the hips size. Unlike the body mass index (BMI), the BAI method doesn't use body weight for estimations. Several studies on population show that the BAI is approximately equal to the percentage of body fat for adult men and women of differing ethnicities. According to the researchers scientific study, the BAI methods of adiposity calculations have similar accuracy to BMI, waist or hip circumference-based approaches. However, none of these techniques (including BAI) offer precise measures of body fat. They are used mainly for basic testing because they are easy to perform and inexpensive. where: hip circumference is in centimeters and height is in meters. Calculating the body adiposity index, divide your hip circumference (in cm) by your height (in m) raised to the power of 1.5, and then subtract 18. What is essential, the measurements of hip circumference should be made by placing a tape measure around the hips, that it goes through the rise of the buttocks (viewed from the side). Check the percentage value of body adiposity index in the last field. Now, find this value in the table below - it seems that our friend is a little bit overweight. 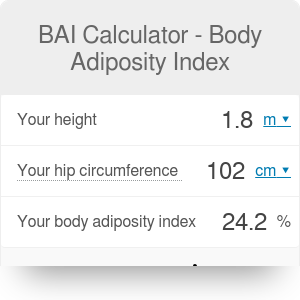 BAI Calculator - Body Adiposity Index can be embedded on your website to enrich the content you wrote and make it easier for your visitors to understand your message.